Broccoli is good for you. It isn’t necessary to follow any dietary trends to be privy to this fact. The New York Times has called broccoli a “nearly perfect vegetable.” Time magazine has named broccoli one of the top 10 foods that “pack a wallop” toward a healthy body. A diet made up of broccoli has science and the press on its side for good reason. 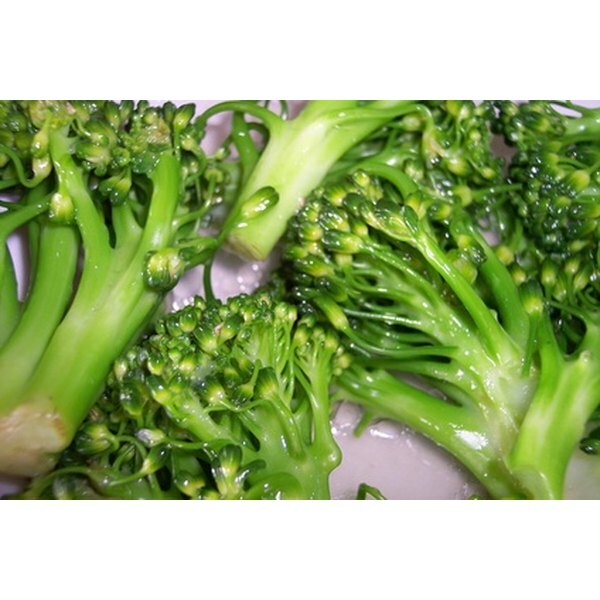 Broccoli is high in vitamin C, which has been shown to boost the immune system and help fight off colds. Broccoli is high in fiber, which aids in the prevention of constipation as well as in weight loss. Broccoli also contains vitamin E, which has been proven helpful in slowing the rate of macular degeneration--which causes blindness in the elderly-- and in reducing the risk of heart attacks for people with diabetes, and preventing asthma and allergies in children whose mothers ate foods high in this vitamin. Broccoli has been touted as a “super food” for women by The Sun Herald. Broccoli is sure to appeal to women because of its ability to aid in weight loss due to its high content of fiber, which is said to help reduce weight because fiber leaves you feeling full for an extended period of time and takes longer to digest than foods that don’t contain fiber. The vitamin C in broccoli, according to registered dietitian Leslie Beck, also aids in weight loss by speeding your metabolism. Research suggests that men might benefit even more than women from a broccoli-rich diet. Prof. Richard Mithen, of the Institute of Food Research in Norwich, says that “diets rich in cruciferous vegetables may reduce the risk of prostate cancer.” Broccoli is a cruciferous vegetable--in the same family as Brussels sprouts, kale, cauliflower and cabbage--and, according to The New York Times, is the best cruciferous vegetable you can eat. Broccoli is said to fight prostate cancer by changing the genes responsible for the growth of tumors. Broccoli is also said to be helpful in the prevention of prostate cancer. Just one portion of broccoli a week has been shown to reduce the risk for prostate cancer in men. It is easiest for men with a GSTM1 gene to be benefited by eating broccoli in terms of it reducing the risk of prostate cancer, but men without the GSTM1 gene shouldn’t worry, as they can simply eat more servings of broccoli and get the same benefits from the cruciferous vegetable as men with the gene. Adding broccoli to men’s diets may not be the only ingredient needed to fight prostate cancer. A study was conducted at the University of Illinois in which rats that had been implanted with prostate cancer cells were fed 10-percent broccoli powder as well as 10-percent tomato powder. Twenty-two weeks later, the rats’ tumors had shrunk, more so than in rats who had been fed solely broccoli powder or solely tomato powder. This research suggests that, although a broccoli diet may be extremely beneficial for you, it is important not to leave out other foods and food groups that, when eaten together, might benefit you even more.